"The college gave me what I needed to do the job I’m doing now." In deciding on her course, Eleanor looked back fondly to her enjoyment of two weeks’ work placement in a florists shop. 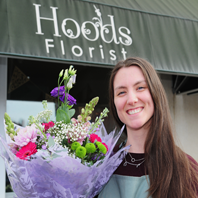 So she ditched her supermarket management course and took the college’s Level 2 part-time City and Guilds in Floristry, passing with a distinction. Eleanor, 27, said: “So I just went for it. I loved it. “The actual site at Broomfield is great. The way you can go out into the grounds and pick foliage and use the flowers in your work is brilliant. “The course taught you pretty much all you need to know to be a florist – there was a wedding unit, funeral unit, hand tied unit, things like that. And when the owner decided to concentrate on her business in Clay Cross, Eleanor jumped at the chance buy the shop “with a little help from the bank of mum and dad”. Find out about studying Floristry at Derby College.